According to developmental psychologists, adolescence is a period of numerous changes, one of which is the adolescent's need to change her/his relationship with parents. 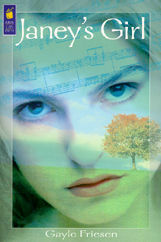 While many YA authors have utilized this theme in their writing, Gayle Friesen, an exciting new voice in Canadian juvenile literature, provides a rich, fresh treatment in her first novel for adolescents, Janey's Girl. August finds Claire Harrison, nearly 15, and her never-wed mother, Jane, motoring from Toronto to rural Smallwood, BC, to visit Claire's recently widowed maternal grandmother, Elsie. Claire, who had never met her grandfather, had last seen her grandmother four years previously when Elsie had visited them in Toronto. Many questions nag at Claire, one being, "I wonder why my mother has done her best to keep my grandmother out of my life," but the question, along with many others, remains unasked, for, as Claire explains, "This is another thing about us. We respect each other's privacy." Consequently, Claire simply and correctly assumes that the trip's purpose is to allow her to get to know her grandmother better; however, as events unfold, Claire discovers that it is really her mother she has not known. Though their mother-daughter relationship has been quite loving, Claire acknowledges, "There are topics we discuss and topics we avoid. And family is one of the topics we avoid." Two individuals, in particular, are rarely mentioned: Claire's father, Harold, and Jane's father, Abe. This trip also marks the first time Jane has returned to Smallwood since she left it 16 years before, at age 18, while still pregnant with Claire. Though Jane acknowledges that "this [coming 'home'] is a bad idea" and states that "I'm not here to undo anything...," in Smallwood, Jane is not seen as the independent, self-assured and successful big city real estate agent; to the locals, she is simply Janey, the Harrison's daughter, and Claire is Janey's girl, Clarissa. During the month-long visit, Claire meets her father, Harold "Mac" McGregor and discovers that she has a half-brother, seven year-old Jamie, who has cancer and desperately needs a bone marrow transplant. Over her mother's strenuous objections, Claire decides that, if she is a suitable match, she will provide the required marrow. Gradually, Claire also uncovers her mother's "story." Jane ultimately explains, "My father was a very rigid man. He lived by a set of rules and he expected everyone to do the same." As a teenager, Jane chaffed under those rules: "I just hated not being able to decide for myself." Ironically, Jane has unknowingly become an Abe clone for Claire recognizes that "she [Jane] just likes to think she lets me make choices." And in the same fashion that Abe had defended his controlling behaviours by claiming that they were his way of protecting Janey from the world's harm, Jane rationalizes her silence about her family history by asserting, "I was trying to protect you, Claire." Fortunately, Claire gains the self-knowledge that she had also begun to employ her grandfather's/mother's pattern of behaviour in her emerging relationship with Jack, a local teen. Gayle says that "I think Janey's Girl's origin was actually on a drive. Coming home from taking my daughter, Alex, to Chilliwack to visit my parents, I was just thinking, 'What would it be like to move back there, to move back to Chilliwack now as a grown-up with a daughter? What if circumstances were such that I was actually going to live there? What would it be like for me, and what would it be like for Alex to grow up in a place where her mom had grown up, a small town?' I'd always been quite anxious to leave Chilliwack for no reason other than that I wanted to move on and settle in a big city and all that. But what if there was a reason to move back? As I shifted the focus from myself to another character, the mother, I wondered, 'What if a secret was the cause of her departure? How would this secret affect the daughter?'" Born in Chilliwack, British Columbia on September, 18, 1960, Gayle is the youngest of four girls. "I have three older sisters. The eldest is 10 years older, and the other two, seven and five. I have the odd distinction of being the youngest as well as kind of an only child, a situation which should make me quite horrible I guess. My parents built our house the year I was born, moved in with me as a baby, and I stayed there all my life. It was nice to grow up in the same neighbourhood and have the same friends going to school." Gayle characterizes herself as being "very much a reader through school. I remember L.M. Montgomery because I wanted to be Anne Shirley and Little Women. Books like that I read over and over again because I just loved them. Emily of New Moon was another of my favourites as well as all of the Walter Farley "Black Stallion" books. And I had the bleak period, the dark years in high school where I read a lot of Harlequin Romances." "I think I always wanted to be a writer, but, at some point, I decided that it was too lofty a goal, and so I put the idea in the back of my mind. I had some interest in being a journalist, but I thought, 'Oh, I couldn't handle watching the news.' I was interested in anything that had to do with writing, but I wasn't quite brave enough to say that I really wanted to be a writer until I was well into my twenties. Everything I thought about doing had something to do with writing, but I could never quite put my finger on anything. I ended up going to college still believing I would get inspired. I went for four years thinking, 'One of these days it's going to hit me, what I should be.' In the meantime, I studied English literature and loved it, but I knew I didn't want to teach." "Married about five years, I was pregnant as I was about to finish my last course for my final credit. The expected delivery date was to be nip and tuck with the course's end date, but the baby, Bradey, didn't think that was such a good idea, and so he came six weeks early and threw off my plans. I ended up finishing my course with a little baby and a very understanding prof who let a few assignments slip by. So, it ended up that, just as I was finishing that phase of my life, I was starting a whole new one raising Bradey. A few years later, there was Alex, and so the pair kept me busy." While Gayle graduated from the University of British Columbia with a B.A. in 1986, "I sort of did my university in clumps. After high school, I went to Europe for about a year, to a Bible school in Sweden. I did some travelling which was wonderful. When I came back home, I worked in a bank for nearly a year to pay off my experience in Europe. I then went to college, got married and took a year of university. After that, I worked for two years in a court house. That was an interesting job which I enjoyed except when I unfortunately adjourned court a little too early some days. It took me a while to catch on to what the judge was saying, but I got to say things like, 'Order in Court' and 'All rise.' It was a good job, but I wanted to finish my degree and I wanted to have kids. I didn't think that I would have much time after they were born, and so I went back to school." "I believe how I moved into writing was just that it finally hit me that this was what I wanted to do and that there was no risk in trying it. It was so simple. I don't know why it didn't occur to me before except I think part of me thought that writers had to have more of an interesting life than I had had. I figured I had to have suffered more or have had a horrible childhood or have been very adventuresome. And I didn't qualify in any of these. It seems silly because, by then, I had read the Bronte sisters and other people who had hardly lived a wild life. So I just decided to try it." "I thought I would start off writing for kids since, as a mother, I was reading so many kids books. Because I was enjoying reading these books again as much as my kids, I would see if I had a talent for that area. Well, I found I wasn't very good at writing picture books for, as it turned out, they were too long. I took a course at UBC with Sue Ann Alderson who wrote Bonnie McSmithers, You're Driving Me Dithers. The course was in the Creative Writing Department, part of the Master's program, but I wasn't taking the degree. Sue Ann's a wonderful teacher. One day, she said, 'Try writing the first chapter of a novel.' I did, and that was just 'it' for me because I could sort of already see the second chapter and the third, and I ended up finishing it. That was something that I could pursue, and it gave me a great feeling." "I actually took two courses from Sue Ann, one after the other and then a different kind of special projects course with another fellow. So, for three years I was at UBC learning aspects of writing for children. And, by the second and third year, I was focusing mostly on writing novels because that felt like the right 'place.' Sue Ann's first course gave us an overview of all types of writing for children. We did some drama, poetry, and some picture books. She tried to give you a little taste of everything. We would critique each others' writing, and that was a great experience. I really recommend it to people who are interested in writing. It gets you over your fear of having somebody read what you've written." Of course, there comes the time when feedback from peers is not sufficient and the aspiring writer must risk confronting the realities and challenges of the marketplace. "I think deep down most people want to hear that their writing has progressed, and so the ultimate compliment would be if Sue Ann would say, 'You know. I think it's ready to send out.' She wasn't about to say, 'It's ready to be published,' or 'It's ready to be accepted.' Rather, it was, 'Take that first step. It's a long road and that's the first step to it.'" "Once you get used to rejection letters, you realize that they're not actually the worst thing in the world, especially when somebody takes the time to say something kind about what you've written. As well as picture books, I sent out that first novel that I'd begun in Sue Ann's class. That was a two year period where I'd have people looking at it and having it gone for six months at a time. Of course, I'd be sending it out to only one publisher at a time because I didn't want to get into trouble with anybody by doing multiple submissions. This was before I discovered query letters and sample chapters, something that I learned from that experience. However, having something out for two years is a very long, frustrating period of time. I don't think that particular manuscript will be published, and I don't think that it needs to be, but I suspect some of its characters may still survive somewhere along the line. You never know." "There was also something else that I'd written after that first novel that was in response to a class assignment, and so I did that for another year. I never really sent it around because it didn't feel right, but it was part of the learning process. There's so much to learn. Janey's Girl was the third novel length manuscript, and by then, I wasn't taking courses. It just came as something that I thought was a good story." "The character of Janey, I think, came from me deciding that my own story wasn't very interesting, and so wouldn't it be interesting if I'd left Chilliwack under difficult circumstances? In fact, I don't even think that when I thought of the character I realized she would have been pregnant and leaving for that reason. The first thing that came to me was Janey's idea that moving back was a mistake or a bad idea, and, after that, the daughter just wonders why. And the oddest thing about this book, and maybe it was a good thing, the story just fell into place from that point. I've experienced the other side of writing enough to know that this was unusual. I've appreciated how much a gift it was because it doesn't always happen that way. That's kind of what I've been going through lately." In writing Janey's Girl, I didn't really know what was going to happen next. It was really quite exciting to write the book because characters would appear and circumstances would come up. As I'd go from chapter to chapter, I almost felt like I was meeting people, and it unfolded in a way that worked. There was lots of rewriting and drafts and all that stuff later as I was trying to piece it all together and make changes, but I'd have to say that the skeleton of the story just kind of flowed. I'm honestly not sure where it came from, but once I'd established that Claire didn't know her father, I knew there was somewhere to go with the story, and then, of course, you just ask the questions, 'Well, why doesn't she?' Why would Janey keep it from her? And what had he done?" I think I went through a few scenarios before I ended up on the one that felt right. All that stuff comes gradually." Jamie was one of Gayle's surprise characters. 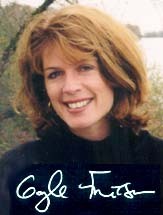 When Claire first encountered Jamie at the stream, Gayle says that she, as author, did not immediately recognize the boy's filial connection to Claire. "I also didn't know that Jamie was sick, but, by the time the man, Mac, came along and rescued the pair from the bull and Claire was meeting him, I had made the connection that he would be her father, and so, for me, it was right there that I knew who Jamie was. The sickness didn't come until later when I tried to think of a way that would take the focus off of Claire's meeting Mac. I didn't want that to be such a focus of the book. I wanted it somehow to be a bit of the backdrop, and the only thing that would, to me, be realistic would be to include something that was more important. Obviously a life and death situation of a young boy puts almost anything in the background." Janey's Girl offered the possibility of a happy-ever-after ending involving a "cured" Jamie and Claire's parents being reconciled. Instead, Gayle opted for a more realistic open ending. "For one thing, I wanted to be true to Jamie's disease. I couldn't have him bouncing out of hospital. And I also didn't see any purpose in a sad ending for Jamie when there's supposed to be a hopeful ending for Claire and her mom. To me, if you are to have that sense of hope in the mother-daughter relationship, then it would be overshadowed by Jamie's death. My son's big question after reading the book was, 'Would Mac and Janey get back together?' I don't know the answer to that. I think Janey would have to work through some stuff herself before such a reconciliation would be even possible. I don't even see their becoming a couple as being a part of the 'happy' ending idea. To me, if Mac and Jamie go and visit Claire and Janey in Toronto, that's the beginning of a whole new thing, and, if that worked out, then that would be the happy ending." "Janey's Girl went through at least three drafts before I sent it out some two and a half years ago. I didn't quite have the courage to give the manuscript to a young person before trying to get it published. My son, in fact, didn't read it until it came out in book form, and then, to my relief, he loved it. Unlike my previous experiences, this manuscript was very quickly accepted, and then, after the contract was signed, it became a two year project. The editing process, my first editing experience, was a great experience. I was working with Charis Wahl. For one thing, there weren't any major rewrites, or at least what she would call a major rewrite. When I received the manuscript back, I would have thought a 16 page letter was a major rewrite. The points Charis made were very specific though and very good. As I got into the work, I realized that it was mostly adding a few scenes here and there and clarifying some situations, but nothing central to the plot was being changed. I think I made Claire a year younger than she was in the original manuscript. In terms of what editing situations are often like, it was not a major rewrite, but, for me, it definitely took some work. It's a very different experience when you're working with somebody else and they're giving you their ideas. Charis had very good ideas and a very strong sense of the characters too. There were some changes involving Jack because originally I had made him not as realistic as Charis felt he should be. I think I made Jack too much a super-teen, and so I tried to play that down a little bit. The changes were more shades rather than actually erasing a lot of stuff and starting again." Writers who are also parents have to find time to work at their craft. "When the children were younger, nap time was when I did my writing. Because my husband works, I've been in the wonderful position that once the children got into school, writing was what I did and still do. Mornings are booked for writing. I quite often go to a coffee shop. That setting puts me in a different frame of mind than being anywhere close to laundry and dishes, horrible reminders. I usually write until one or so, and then, in the afternoon, I knock off. You can get a lot done in four hours five days a week. I do longhand to begin with, and then I come home and put it on the computer. When I'm in the second draft stage, I work more at home because then I'll be working on the computer. However, for the first draft, which is the most fun, I do it all in longhand, and I get cramps in my hand. I think a person would have a heck of a time following the progress of my longhand. Reading it would be one thing. I don't outline because I don't find that works for me. I had a writing teacher once say that, if you know the ending of the book even while you're writing it, then it's probably a pretty thin book. Initially that was discouraging because I'd get some great concluding scene in my head, but I realized that he's actually quite right because you've got to let yourself be surprised as well and open to change." "I'm part of a writing group that meets every six weeks or so. The reason I mentioned my writing group in the "Acknowledgements" of Janey's Girl was that they were so key in their comments and their encouragement. They know what it takes to keep going after this year after year after year, and that's just invaluable. While we met during the writing classes, it's really been in the last two years that we've been a writing group. They're there to read your stuff and be able to give you the kind of critical comments you need because friends or relatives read it and go, 'That's great!' I don't know if this is common or not, but I didn't really have a strong sense that I would ever be published. While I knew that I loved writing, I had read so many wonderful books, so, 'Why me?' especially when you hear about how many manuscripts come over a publisher's desk in any given period." "My writing often starts with the question, 'What if?' With the story that I'm working on now, I was sitting around the kitchen table listening to my mother talk about my Aunt Margaret who's had a very interesting life. She's had a very rough time, and she's had everything thrown at her, but she's managed to come up as a stronger person. I thought, 'What a neat story that would be,' and so the character came out of her, but then she became a different character than Aunt Margaret. The main character is a boy, Ben. I'm quite nervous about writing from a boy's perspective because I don't know if I can do it, but I'm going to try. Growing up, I always thought it would be great fun to be a boy, and so I'm really enjoying this. Boys get to say stuff differently. I hope it's working because it feels like it's different than the voices of other characters that I've worked with. I sort of wanted to do it for Bradey, too. While he enjoyed Janey's Girl very much, I do know that boys tend to read about boys, and I loved the idea of giving it a try. I have no idea if I can pull it off or not. So, we'll see." "Every time one novel ends another one starts. I keep thinking, 'Maybe I'll try a screen play one day.' That would be fun because I just enjoy dialogue so much, but then I think about another novel and I get to work on that. I also have too pretty young kids, and so there's a lot of other stuff in my life. Maybe one day I'll have more time. I'm finished the first draft of the new novel and doing some of the 'researchy' stuff. I kept putting in the margin, 'research this' and 'research that.' Now I'm doing the 'work' part. I'm using some stuff from my uncle's memoirs which has been very interesting." "The great thing about writing for kids is that they're at such an interesting and crucial point in their lives. They've spent their young childhood being fairly certain about who they are, and now - with adolescence looming - they're peeking around the corner wondering, 'What's next?'" Janey's Girl. Kids Can Press, 1998. Grades 6-10. 1-55074-461-5. Hardcover; 1-55074-463-1. Paperback. *This article is based on a Winnipeg, MB/Delta, BC, telephone interview conducted on June 28, 1998.